The events of August 11 and 12, 2017, certainly provided challenges to the Charlottesville community, and in response to those challenges, our teachers provided incredible learning and reflection opportunities for our staff and students. Collage from the Charlottesville City schools all-staff convocation on August 15, 2017. Our response to the rallies began with our teachers, who returned to work just days after the rallies. We held an emotional and healing staff-wide convocation to address the events directly. Giving teachers time, space, and resources was one of our first priorities. ﻿﻿﻿ Even our elementary students have been given opportunities to process these events through conversation, counseling, community-building activities, and more. As a school division that embraces the arts, we have been heartened to see our schools bring the power of music, art, and literature to bear as we facilitate crucial conversations about A12 itself and the deeper issues the events raised. Musically, this includes an inspirational collaboration with Metro Nashville Public Schools using BeBe Winans’ song “Right Now (Need One Another).” (Do yourself a favor and watch the video now. More information can be found here.) Relating to the visual arts, our schools have organized paint-ins and school-wide art projects that celebrate both commonalities and differences. 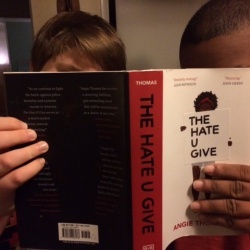 And we have drawn upon the power of literature by organizing a One Book campaign to promote the reading of Angie Thomas’s award-winning young adult novel, The Hate U Give. In addition to classroom discussions, Charlottesville High School invited parent, activist, and UVa professor Lisa Woolfork to lead a powerful conversation about the book with all of our ninth-graders. This Big Read was complemented by what you might call a Big See — dozens of community screenings of the award-winning documentary, I’m Not a Racist, Am I? 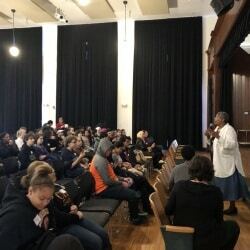 In addition, throughout February, CHS students organized a series of community speakers who offered opt-in, in-school presentations to students for Black History Month, which concluded with the school’s annual assembly. This year’s assembly speaker was Rashard Davis ’16, winner of a 2018 Super Bowl Ring with the Philadelphia Eagles! Relatedly, a contingent of CHS students spent a day at the Jefferson School African American Heritage Center, working with the Charlottesville Youth Council to make meaningful change as part of the community’s “Dialogue on Race.” For more on this important conversation, click here. In November 2018, the Charlottesville City Schools School Board unanimously passed a resolution that bans students from wearing clothing that depicts symbols “associated with racial hatred and violence.” Their resolution specifically cited the violence in Charlottesville and the Confederate and Nazi imagery displayed during the violence. This conversation — and the larger work toward racial equity in our schools and in our country — continues. At Charlottesville City Schools, we are committed to this work. Mandell, Josh. “City School Board Shows Support for Dress Code Changes • Charlottesville Tomorrow.” Charlottesville Tomorrow, 4 Oct. 2018.